The production of food products is one of the most interesting production fields. This is because natural products are never completely alike. New trends and new technologies are constantly creating new challenges. The Uelzena Group with its four highly specialized and high-tech sites as well as its milk powder plant in Neumünster, which is operated with other partners, is rising to these challenges. Our product portfolio comprises about 1,000 different products ranging from milk powder to instant cappuccino, from butter to cheese and from health products to special formulations for the industry. And every year, even more new products are being added. Our employees work with the latest machines and lines including a lot of special equipment that is only found at Uelzena. This broad product range and the diversity of the complex production processes ensure that our staff is always involved with varied and demanding tasks. Our four sites offers jobs for every one according to his or her interests and abilities — in terms of region and scope of work. The parent plant in Uelzen (Lower Saxony) is the largest production site of the Group. It houses the areas of drying, dry mixes, butter fat and it is the packaging center for small packages. In Uelzen, between 400 and 500 different products are produced; every year between 20 and 30 new ones are added. As a growing site with a broad product range and many customer-specific requirements, we offer a large variety of tasks and excellent career opportunities to our employees. We promote their further development, for example in becoming technicians, shift supervisors or master craftsmen. For project development and the set-up of new equipment, we also rely on the expertise of our staff. The dairy Altmark-Käserei in Bismark (Saxony-Anhalt) processes about 900,000 liters of milk each day into cheese and about 200,000 liters of cream into butter. This large modern site is characterized by a high degree of automation. There are hardly any tasks that are physically strenuous. We respond quickly to new requirements and we continue to employ new technologies. We are one of the largest employers in the region and we support our colleagues with further education measures so that they are able to advance professionally. We do this because we want to keep our employees for as long as possible. The Ratzeburg site (Schlesweig-Holstein) focuses on the production of instant beverages. Schoppe & Schultz processes a total of 120 different recipes ranging from milk chocolate flakes to cappuccino variations and chai tea which are also in organic and fair trade qualities. Our employees process high quality raw materials on special equipment. We are a small and flexible team and are able to implement our customers’ requests at short notice. We also accept special requirements. Our employees can operate at all stages of the production process and can handle new products from the first trials to series maturity. They are responsible for the production and are encouraged to suggest optimization measures. A flat hierarchy provides a relaxed working atmosphere and low staff fluctuations. Warmsen’s specialty products are made in the county of Nienburg/Weser (Lower Saxony). 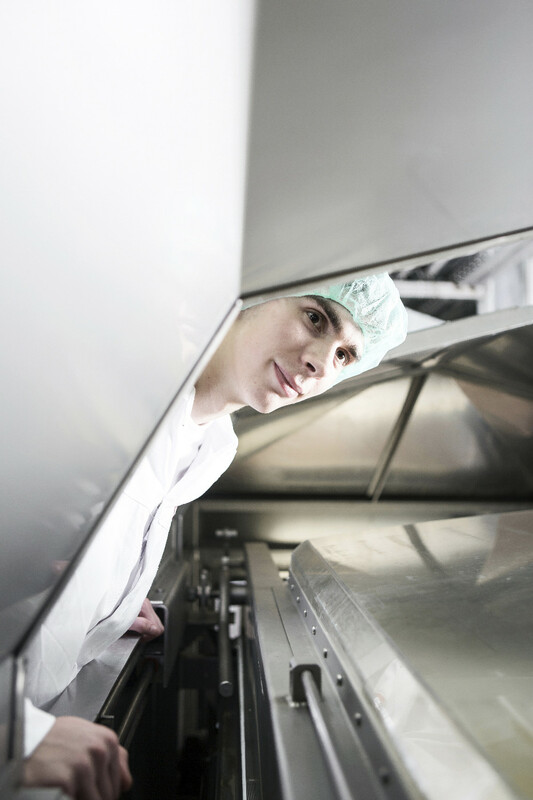 At this site we process raw milk and cream into products for the confectionery and delicatessen industry. Our plant is quite small and focuses on craftsmanship. This means that our employees carry out a lot of varied tasks. They handle the entire processing chain from the acceptance and testing of raw milk to the processing and packaging. They assume the responsibility for all processing steps. In Warmsen, the employees are in constant dialogue with the management. Being a small site, we have a flat hierarchy and tackle production challenges as a team. In Neumünster (Schleswig-Holstein), Uelzena and its partners operate one of the largest and advanced milk powder plants in Europe. At this site, a young team produces 60,000 tons of milk powder every year for the international market. The spraying tower is one of the largest in Europe. Our employees in Neumünster work with state-of-the-art equipment with electronic controls. In their work, they combine craft skills and high technology.